NOW GET YOUR FINANCIALS XBRL READY WITH OUR EXPERT TEAM OF PROFESSIONALS. Audit Set Of Account Will be Used as Input. 2. Reports will be generated as per MCA guidlines. Review will be done by the Quality Team. Output File will be delivered for filing of XBRL. 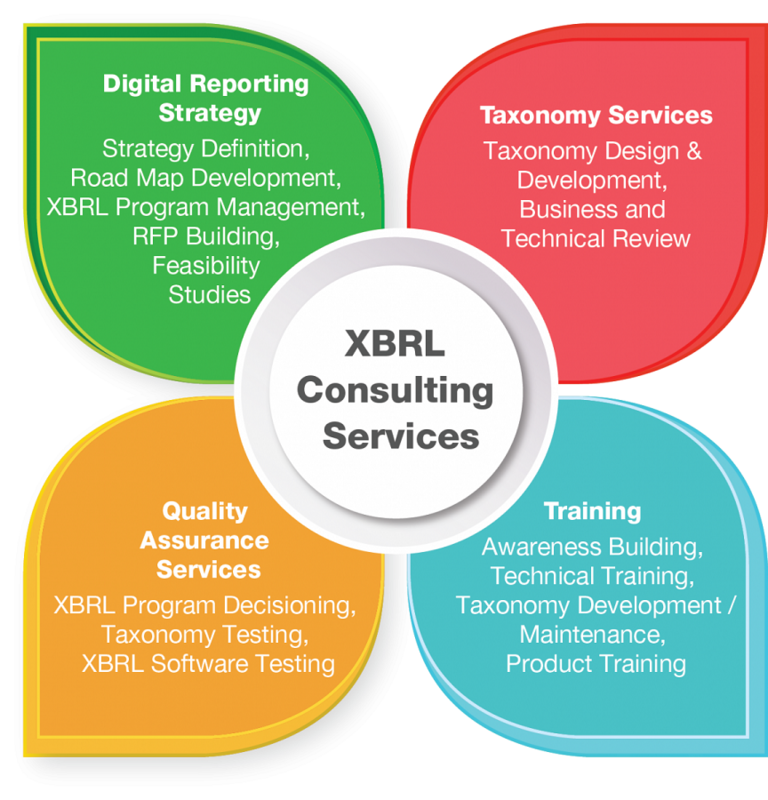 XBRL is a world-wide standard, developed by an international, non-profit-making consortium, XBRL International Inc. (XII). XII is made up of many hundred members, including government agencies, accounting firms, software companies, large and small corporations, academics and business reporting experts. XII has agreed the basic specifications which define how XBRL works. XBRL is a member of the family of languages based on XML, or Extensible Markup Language, which is a standard for the electronic exchange of data between businesses and on the internet. Under XML, identifying tags are applied to items of data so that they can be processed efficiently by computer software. XBRL is a powerful and flexible version of XML which has been defined specifically to meet the requirements of business and financial information. It enables unique identifying tags to be applied to items of financial data, such as ‘net profit’. However, these are more than simple identifiers. They provide a range of information about the item, such as whether it is a monetary item, percentage or fraction. XBRL allows labels in any language to be applied to items, as well as accounting references or other subsidiary information. XBRL can show how items are related to one another. It can thus represent how they are calculated. It can also identify whether they fall into particular groupings for organisational or presentational purposes. Most importantly, XBRL is easily extensible, so companies and other organisations can adapt it to meet a variety of special requirements. The rich and powerful structure of XBRL allows very efficient handling of business data by computer software. It supports all the standard tasks involved in compiling, storing and using business data. Such information can be converted into XBRL by suitable mapping processes or generated in XBRL by software. It can then be searched, selected, exchanged or analysed by computer, or published for ordinary viewing. XBRL allows the creation of reusable, authoritative definitions, called taxonomies, that capture the meaning contained in all of the reporting terms used in a business report, as well as the relationships between all of the terms. Taxonomies are developed by regulators, accounting standards setters, government agencies and other groups that need to clearly define information that needs to be reported upon. XBRL doesn’t limit what kind of information is defined: it’s a language that can be used and extended as needed. stop poor quality information being sent to a regulator or third party, by being run by the preparer while the report is in draft. critical rules can be bounced back to the preparer for review and resubmission. flagging or highlighting questionable information, allowing prompt follow up, correction or explanation. create ratios, aggregations and other kinds of value-added information, based on the fundamental data provided. XBRL allows concept definitions to be prepared in as many languages as necessary. Translations of definitions can also be added by third parties. This means that it’s possible to display a range of reports in a different language to the one that they were prepared in, without any additional work. The XBRL community makes extensive use of this capability as it can automatically open up reports to different communities. Outsourcing the filing to a professional accounting services firm will give you the peace of mind in meeting your company’s compliance needs. For a small investment, you are likely to save a lot of time which can be devoted to doing more business, rather than going through the hassles of figuring out how to use the system, extracting what to disclose, keying in, and checking.